Braving the threat of the government to cut one day’s wages, majority of state government employees and teachers too took part in the strike. Workers and employees in all sections staged huge marches before their respective work places. University Examinations and Public Service Commission Examinations were postponed. Employees of Reserve Bank of India and other banks, LIC, KSEB, BSNL and NABARD were also participated in the strike. Though the BMS national leadership announced to withdraw from the strike, the workers belongs to this Trade union too participated in strike various factories. 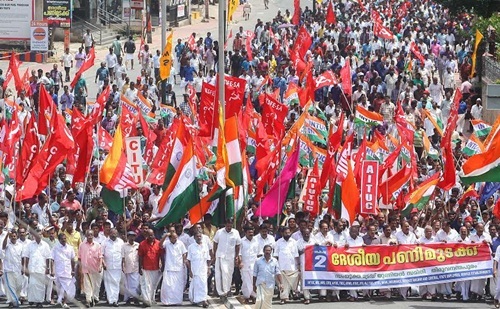 A massive rally before the secretariat building in Thiruvanathapuram was inaugurated by CITU state president Anathalavattam Anandan.